Gloria Connors with the young Jimbo: What is a visionary? If indeed all action begins with a thought, then the seminal thinker in this story is Gloria Connors. But it's hard to call someone so narrowly focused a visionary. Supposedly visionaries are expansive, able to spot phenomena on the horizon undetectable to mortals. There was nothing expansive about Gloria Connors. To many who came in contact with her during her son's career, she embodied paranoid provincialism	, a pushy stage mother only able to see the world through the needs of her beloved Jimbo. Tennis is rife with stories of Gloria holding sponsors, promoters and media hostage for money and time. Permit another definition of visionary: a peculiar mix of personal desire, disparate skills, and fortunate outcomes. Conventional wisdom says they see the future. But perhaps they immerse themselves so completely in their own present�absorbed purely in their private passions�that they generate a special frenetic energy. "The man who writes about himself and his time," said George Bernard Shaw, "is the only man who writes about all people and about all time." And while it is unlikely Gloria Connors read George Bernard Shaw, she knew what it meant to be one of his most famous characters, the controlling instructor Professor Henry Higgins from Pygmalion. 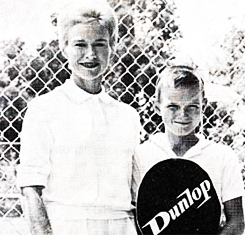 At heart she was dedicated not just to the tennis life of her famous son, but to many other students as well. The year is 1952, the year Jimmy was born. It has now been 10 years since Gloria Connors was the 13th best junior tennis player in the United States. A year previous, in 1951, she gave birth to her first son, Johnny. Now, as she carries Jimmy in her womb, she clears out land behind her East St. Louis house on 632 N. 68th Street to make room for a tennis court. She was born Gloria Thompson, the only child of an East St. Louis policeman, Al Thompson, and his wife, Bertha. It was an athletic family. Al was a Golden Gloves boxer. Bertha played tennis. Early on Gloria must have become very aware of social strata. East St. Louis was in Illinois, a different state and a different world, located across the river from the big snooty city of St. Louis, Missouri. One of the four bridges to East St. Louis: a different state and a different world. Well into the 1990s this schism between affluent St. Louis and those east of the Mississippi continued. To give one example that tells the whole tale: the story of Jeff Heely. Jeff, then in his 40s, was an accomplished athlete who'd served a stint in the Navy. Upon his return to the St. Louis area, he became a successful executive in finance. A friend suggested he join the prestigious St. Louis Country Club. Heely was asked where he attended high school. When he answered Belleville, Illinois, a few miles east of East St. Louis, the friend pursed his lips and told him it just wasn't going to work out. The East St. Louis of Gloria Thompson's youth was a miniature version of many other American cities, a mix of blue-collar whites and minorities sifting their way through the economic ups and downs of the first half of the 20th century. It was a period when America shifted from a small-town agrarian economy to urbanized industrialism . This transition was particularly troublesome in such border states as Illinois and Missouri, where long-standing xenophobic attitudes created friction between social classes and races. Early in the 20th century, there were labor struggles in East St. Louis. Blacks migrated from Mississippi and Alabama to take the jobs vacated by striking workers. In the aftermath, an undertone of racial tension seeped through East St. Louis. As one long-standing citizen told me, "It was a nice city before the coloreds got involved." 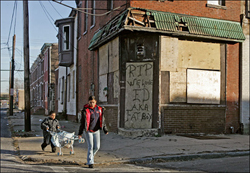 East St. Louis: black migration, labor strife, and an air racial tension. It's likely policeman Al Thompson was near the frontlines for one of the worst days in the city's history. On July 2, 1917, a race massacre occurred in the streets of East St. Louis that was so destructive its files were kept classified by the U.S. Government until 1986. It's estimated that 40 to 150 African-Americans were killed and that another 6,000 were driven from their homes. Though it's presumptuous to assess the Thompson family's racial attitudes, one can only imagine the psychic impact an event like that had on the entire city. This impact would have still been felt during the long reign of East St. Louis' Democratic mayor, a man whose name was John Connors. If not exactly a city on the brink, the East St. Louis of Gloria Thompson's childhood was far from serene. No doubt this daughter of an ex-boxer turned policeman and a feisty athletic mother rapidly learned how combustible life could be. Tennis was a way for Gloria to make a name for herself. She played tennis at Jones Park, an East St. Louis facility she once said was as nice as any country club she'd ever seen. While Bertha was merely a competent recreational player, Gloria became far better, excelling as a junior in the Missouri Valley section of the then USLTA. For a time, she played the national circuit of tournaments all around the country. Since tennis in those days was strictly an amateur sport, there was no prize money. Players stayed at the patrician club members' homes. They competed by day and by night enjoyed elegant dinners and dances. After a few years of this life, a player, man or woman, settled down to domesticity. Players who remember Gloria from those days on the circuit recall a sweet, competitive young lady who was good, but not quite great. After she stopped competing in the late '40s, she drifted to work as an instructor. 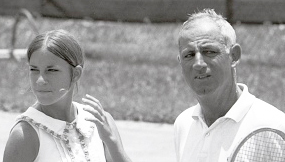 Chris Evert and her father Jimmy�the former boyfriend of Gloria Connors. But Gloria Thompson didn't need tennis to support her. With her delicate features and youthful, athletic appearance, she was an attractive bachelorette. 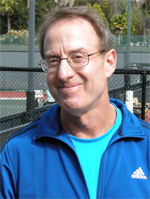 Among those she dated was a top player from upstate in Chicago, Jimmy Evert. Decades later, Jimmy Evert's daughter, Chris, saw his father with Gloria at junior tournaments and worried that they might reunite and break up her parents' marriage. But the person who'd had his eye on Gloria Thompson for a long time was James Connors, son of the former mayor. Little is known of this man. He was educated at Notre Dame. Upon his return to East St. Louis, he was granted the kind of job classically connected with political patronage. James Connors was in charge of toll collections on the Veterans Bridge, one of four bridges that linked East St. Louis to the bigger, adjacent metropolis across the river. "Big Jim" was the classic good old boy, a man who appreciated the relaxing qualities of golf and a nice scotch at The Stop Light Restaurant. Gloria, Jimmy, and probably, Jimmy's dad. 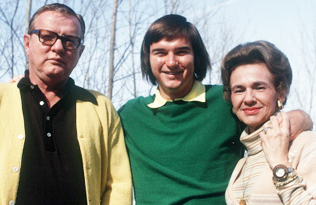 One of the first major magazines stories on Jimmy Connors, a 1974 Sports Illustrated cover piece, included a photo of Connors with both parents. The writer, Curry Kirkpatrick, was politely steered away from any interviews with the boy's father. The son, always eager to credit his mother, discussed his father with the dispatch of a CEO recalling a terminated employee. 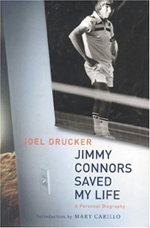 In 1996, I was part of a group of five that played with Connors in a Pro-Am tournament. "So good to be with you, Mr. Connors," said an enthused woman. "I'm not Mr. Connors;" he countered. "That was my father." "Mister this, sir that, all that formal crap." The disgust in his voice was greater than I had heard him express for Ivan Lendl. "My father," Connors said�then he paused longer than usual. "My father, he wasn't around, wasn't around for any of it."